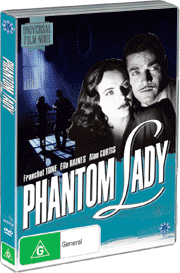 Now available on DVD for the first time in the Australian market – a quality boxed selection of the MGM Film Noirs. Ranging from 1946 to 1959, the films cover the second phase of the genre commencing with Orson Welles’ ‘The Stranger’ through to Robert Wise’s 1959 character study ‘Odds Against Tomorrow’. Also includes ‘He Walked By Night’, and ‘He Ran All The Way’. The films come in a quality hard-case cover suitable for bookshelves, and package includes essay with annotations. A must have for fans of Film Noir. 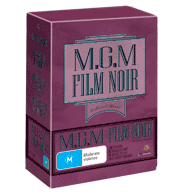 Now available on DVD for the first time in the Australian market – a quality boxed selection of the MGM Film Noirs. Ranging from 1946 to 1959, the films cover the second phase of the genre commencing with Orson Welles’ ‘The Stranger’ through to Robert Wise’s 1959 character study ‘Odds Against Tomorrow’. 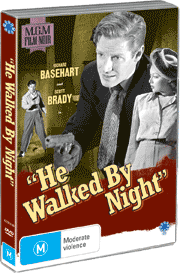 Also includes ‘He Walked By Night’, and ‘He Ran All The Way’. The films come in a quality hard-case cover suitable for bookshelves, and package includes essay with annotations. A must have for fans of Film Noir.